Japanese Episode AG 079: "Banebuu no Sagashi Mono!?" American Episode 351: "Pearls are a Spoink's Best Friend"
Satoshi and his friends are getting ready to start their day when a Banebuu appears. 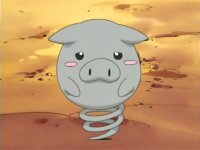 Masato notices something strange about the pokemon, and soon he realizes that the pig pokemon is missing the pearl on its head. Satoshi and his friends decide to help the pokemon find it, so they return to the spot where Banebuu last saw it. As everyone searches for the pearl, Banebuu mistakes a number of round-shaped pokemon for its pearl, resulting in hilarious antics. The pokemon's pearl is eventually found, but the Rocket-Dan appear to steal it. Even though they are sent blasting off, they actually succeed in claiming the pearl for themselves. Satoshi-tachi catch up with Musashi and the others, so the Rocket trio take refuge in a nearby festival. As Satoshi gets lost in the crowd, Musashi is coerced into trading the pearl for a Hinbass from the Koiking Salesman. However, it turns out that the Hinbass is merely a Koiking painted to look like the rare pokemon! Musashi-tachi and Satoshi-tachi eventually meet up, and Nyasu explains what happened to the pearl. Everyone confronts the Koiking Salesman, and soon a battle between the Rocket-Dan and Satoshi breaks out. As the Koiking Salesman escapes, the Rocket-Dan is sent blasting off. Now that Banebuu has its pearl again, Satoshi and his friends get back on the road to Hiwamaki City. The first part of this episode was really boring to me. I mean, the episode starts off with a group of kids is helping a pig find a pearl for NO REASON AT ALL! But the second half of the episode more than made up for it. With the return of the Koiking Salesman and the interaction between the Rocket-Dan and him, you forget the entire first half entirely. The scene that I thought would be edited for the dub turned out to be, so there were no surprises there for me. Otherwise, the dub was good. The first three seconds of the episode are cut. A second is cut from the pan shot right after the episode's title screen. James: "That looks to me like the pearl off a Spoink's head!" 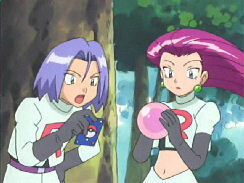 Jessie: "Well, I think it would make a much better fashion statement hanging around my neck." 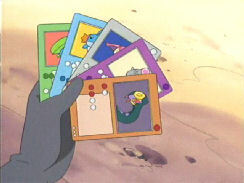 In between the two corresponding lines in the Japanese version is a seven-second scene of Kojirou checking his collection of Pokemon TCG-like cards. 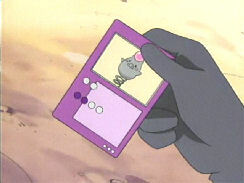 He finds Banebuu's card, and then notices that the pearl that they have is the same one as the one that's supposed to be on the pokemon's head. The scene was most likely cut because of that law that says that TV shows on American TV can't showcase any product available for sale in real life. And since those cads (slightly) resemble the TCG cards that are in stores now, the scene had to get the ax. This is really minor, but the computer that the Koiking Salesman has (the one that explains that Hinbass evolves into Milokaross) had Orchid-Hakase's voice in the Japanese version. In the dub the voice coming out belongs to some random guy.